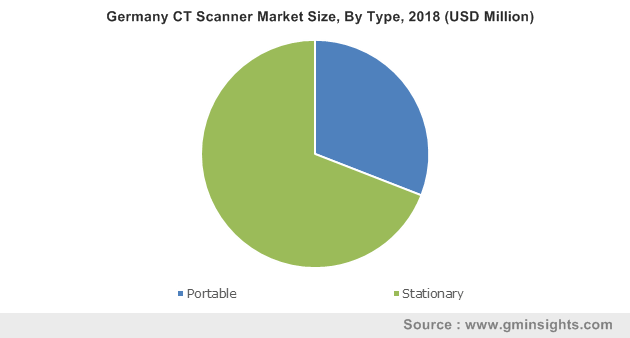 CT Scanner Market size was valued at USD 5.2 billion in 2018 and is expected to witness 5.4% CAGR from 2019 to 2025. Technological advancements in CT scanners will increase its adoption and surge the industry growth. CT scan is a long-established imaging technique that has witnessed ample modifications and improvements over the past few decades. Significant evolution in this industry can be confirmed by the replacement of conventional systems by the 4th generation CT scanners. Also, technological advancements have reduced the dose of radiation without hampering the quality of image. Such technological advancements coupled with the procedural benefits of CT scan over other imaging modalities such as MRI and X-ray will stimulate its demand over forthcoming years. Rising incidences of cardiovascular diseases globally will augment the CT scanners market growth in forthcoming years. For instance, according to WHO, around 17.9 million people die annually due to cardiovascular diseases globally. Disease burden and mortality rates have been significantly reduced due to accurate diagnosis of chronic conditions at early stages. As recently developed CT scanner allows the early and accurate diagnosis of several chronic diseases, its demand will grow in the near future. CT scanner is a cost intensive capital equipment and its high cost is expected to hamper affordability, particularly in developing and underdeveloped region that will restrain the CT scanner market growth. 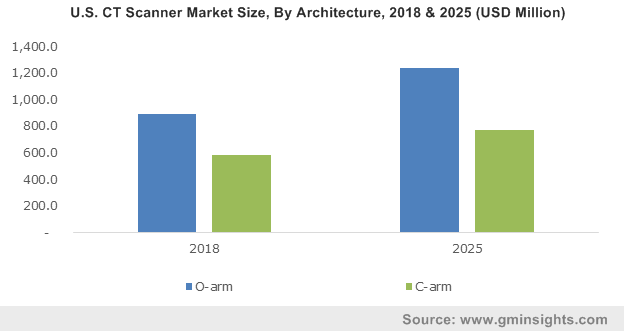 O-arm architecture segment dominated the industry in 2018 with revenue size USD 3.2 billion owing to its wide range of clinical applications. O-arm architecture is extensively used for spinal surgeries. As reported by WHO, annually around 250,000 to 500,000 people suffer a spinal cord injury globally. Growing number of spinal cases across the globe requiring use of O-arm equipment will trigger the segment growth. C-arm segment is expected to witness 5.1% growth throughout the analysis period owing to its massive usage for fluoroscopic intraoperative imaging in certain orthopaedic procedure and emergency care. Additionally, C-arm scanners are widely utilized in minimally invasive surgeries as they provide improved spatial resolution and accurate patient positioning. Aforementioned factors are projected to boost its adoption to enhance the success rate of surgeries. Portable segment was valued at USD 2 billion in 2018. Considerable revenue size is due to number of advantages and convenience associated with it. Portable scanners require less space on the floor and weigh less. Additionally, portable CT scanner also speed up the time of scanning and are highly preferred in patients suffering from stroke that stimulates the segmental growth. Stationary CT Scanner segment will have sluggish 5.4% growth during forecast timeframe owing to the large area occupied by stationary CT Scanner. However, stationary scanner are commonly used by hospitals and institutions that admit large number of patient suffering from heart stroke and brain injuries every month. Moreover, recently developed stationary systems are sufficiently reliable and provide accurate diagnosis that further escalates the segment growth. Cone beam segment is forecasted to have 5.9% growth over the analysis period. The robust segmental growth can be attributed to increasing demand for computed cone technology in cosmetic and orthopaedic surgeries. Also, reduced risk involved in advance cone beam imaging, rapid scan time and its extensive use in treatment of dental diseases will further escalate the segment growth. High slice technology segment accounted for 41.6% in 2018 due to superior quality of images offered in contrast to low slice devices. Recently developed 265-slice CT scanners can provide better quality images as compared to the 64-slice systems. As industry players are putting enormous efforts for the development of high slice systems, the segment is forecasted to witness healthy growth. Human segment will have 5.5% growth during the forecast years as CT scanners are highly preferred in human diagnostics. Increasing prevalence of cardiological, neurological and oncological disorders will drive the demand of CT devices for human diagnostics. Arrhythmias and other chronic conditions are better suited for high-slice systems that provides quick diagnosis as well as offer a greater imaging area. This will enable human application segment to retain its dominant position in near future. Research segment accounted for 10.7% revenue share in 2018 and is expected to have considerable revenue share in the upcoming years due to its growing applications in the field of research and development. For instance, CT scanners have been increasingly used for biomechanical analyses and paleoanthropological research. Moreover, various organizations such as national cancer institute are funding research for improving application of CT Scanner in diagnostic fields. Such favourable initiatives will further propel the research application segment growth. Hospitals segment will witness 5.3% growth during the forecast period. CT scanner is one of the essential equipment in hospital premises as several diagnostic and therapeutic procedures that are carried out in hospitals involves use of CT devices. Moreover, high demand for minimally invasive surgeries proves beneficial for segment growth. Therefore, increasing number of hospital admissions and surgical procedures are the factors influencing demand of CT scanner in the hospitals. Ambulatory surgical centres segment was valued at USD 1.4 billion in 2018. Ambulatory surgical centres often install portable CT Scanner that require less space on the floor and have faster scanning time. Also, patient inflow to ambulatory is increasing because of less waiting time, lower surgery cost, and convenience of location and hence, growing patient flow in ASC’s is bound to increase the demand for CT scans. North America CT scanner market accounted for 29.5% revenue share in 2018. Considerable revenue share can be accounted to the high awareness regarding availability of CT scanner coupled with high healthcare expenditure. Furthermore, favourable government initiatives that supports development in computed tomography devices will positively impact the industry growth. North America CT scanner market is matured therefore, new entrants will find it difficult to grab potential market share. This opportunity can be leveraged by already established players as the threat of new entrants remains low. 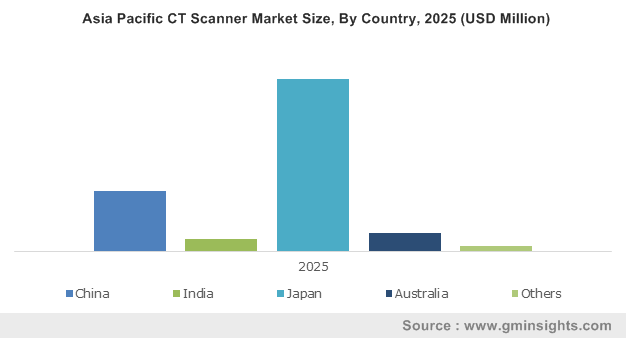 Asia pacific CT Scanner market is expected to grow at 6.8% throughout the analysis timeframe. Considerable regional growth is attributable to increasing incidences of cardiovascular diseases due to drastic lifestyle changes that has inflated obesity levels. Additionally, favourable demographic trends such as growing elderly population base along with rising disposable income will fuel the regional growth over forecast period. 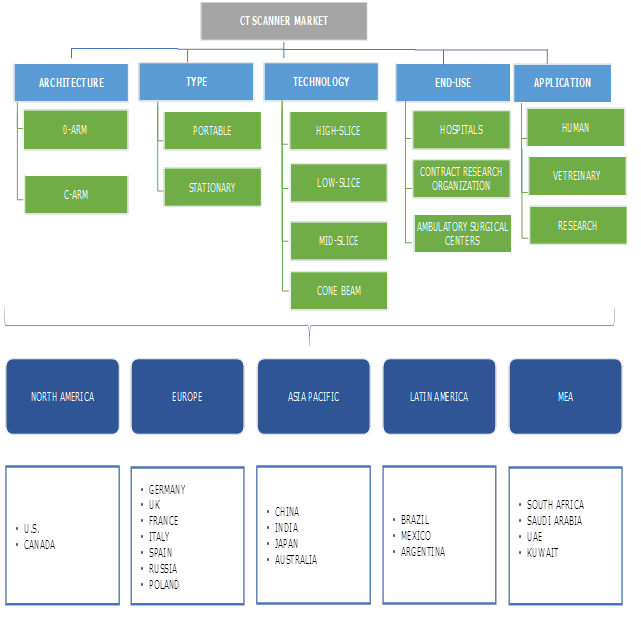 Prominent industry players operational in CT Scanner market are Accuray, Koning Corporation, Carestream Canon Medical Systems Corporation (Toshiba Corporation), Koninklijke Philips, CurveBeam, Hitachi Medical Corporation, GE Healthcare, Medtronic, Planmed Oy, Neusoft, Samsung, Shenzhen Anke High-Tech, Siemens, Healthineers, Xoran, and United Imaging Technologies. Industry players focus on achieving deals from hospitals and clinics for supplying superior quality CT Scanner. In addition to this, companies are also actively involved in introducing innovations in the devices. For instance, in March 2018, Accuray signed an agreement with Apollo hospital for the acquisition of two Radixact systems that will lead to expand access cancer treatment technology across India. Undertaking such initiatives will foster company’s CT scanner devices sales. CT Scanner industry can be traced back to 1970’s with the introduction of first CT scanner in 1971. Earlier developed computed tomography device had single detector that was able to diagnose brain injuries. Later, first generation CT Scanner were developed that were capable of better diagnosing chronic heart conditions. As technology progressed, second and third generation devices with enhanced capacity were introduced. Currently, key industry players have developed fourth generation CT Scanner with multiple detectors that minimized the time required for diagnosis. At present, this industry is matured particularly in North America and consistent technological advancements has imparted North America enormous growth opportunities. However, in emerging economies this industry is still in developing phase due to affordability issues associated with the high cost of these devices. Therefore, government and other regulatory authorities in developing countries are actively taking initiatives that have helped in lowering the price of CT scanners drastically.